"It's a deep dive into why did things that everybody knows about suddenly disappear. We did it in a fun way." Brian Volk-Weiss, CEO of Comedy Dynamics, producer of The Toys That Made Us and Discontinued. Film and TV producer Brian Volk-Weiss returns to the podcast to nerd out about nostalgia. 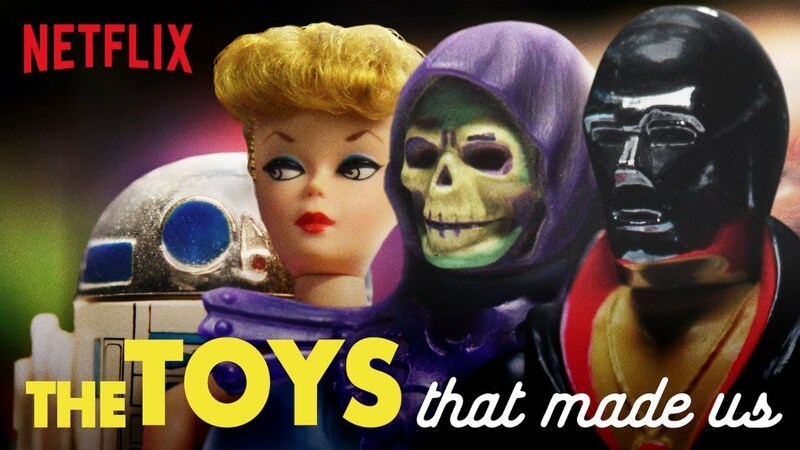 Filmed in his Los Angeles offices, Brian talks about the upcoming season of The Toys That Made Us on Netflix and what he has learned making that show. Plus, as the head of Comedy Dynamics, Brian has helped produce some of the most iconic stand-up comedy specials, and he tells us what he looks for when creating them. Also, his brand new show Discontinued premiers on December 16th on the CW with host Andre Meadows, Black Nerd Comedy, and at the end of this episode, we called Brian back to talk about this exciting new show. ﻿﻿First of all - WE HAVE SOCIAL MEDIA! On Science, we talk about the sound of wind from Mars and inSight, plus a spacecraft named OSIRIS-REX reached a small asteroid to take samples and return to Earth in 2023. Then the history of Christmas Carols is explained along with the recent controversy around Baby it's Cold Outside. Finally, learn about the final mug releases from the World's Strongest Coffee in 2018. ﻿﻿Jeff: I just got to open up by thanking you to take time to meet with us in person. Brian: Thank you. You guys are awesome. Jeff: It was so much fun to have you on the show last season. When we talked to you the last time, The Toys That Made Us had just premiered, I think it just premiered that week. The first season. Brian: Yeah. It was like right there. Jeff: Now, we are all waiting with bated breath for Season 3, which is really exciting. Let's talk a little bit about what is it been like from now that it's like this snowball, like what's it been like? How's the reception been of the show? Brian: I mean, I will say something to you, you're going to laugh. You can think I'm joking. It's funny, like you have every right to laugh, everyone else laughs when I say this, but I don't normally give it this preface. I'm not joking, I'm serious. I've made a lot of crap, like really crappy stuff, never on purpose. But you never you never know how things are going to turn out. For variety of reasons, I have made stuff that has not been well received by our fellow Americans. So, Toys, I mean, the scorecard is literally like one bad review and over 300 amazing reviews. Brian: So, maybe part of the reason I preface it like that is just to not seem like an egomaniac lunatic, but I've never seen anything like it, I've seen the opposite of it many times. I have all my bad reviews framed in my office, can I tell you my favorite one? Brian: Dane Cook, Jessica Alba, one of the penguins, that's what its always reminded of. All Fs, all one stars, halfs … I mean, horrible. Truly, one and only times in my entire … I just made employee month, which again was not beloved, but was getting three stars and C-s, but Good Luck Chuck, all Fs and one stars out of, like horrible. 20 years, I've been doing this, one of the only time, literally, couldn't get out of bed depressed. The movie came out, I think, in July or August, right? So, it's just vicious, vicious, just awful. Cut 2, it's now December, you know, I'm past it, things are moving on, life is safe, then in December, all the magazines and everything, they start doing Top 10, Top 10 books, Top 10 outfits, Top 10 foods. Brian: So, they had Top 10 movies. I got very nervous, I looked, we didn't make the bottom 10, because they always do top 10 and bottom 10, and I didn't make the bottom, Good Luck Chuck wasn't on … I was like, “Phew.” I thought I was safe. Then they had foods list, there was the top 10 foods, and they actually didn't even have 10 bad foods, they only had three bad foods. One of the bad foods was that year, they had, Oreo had made an ice cream pizza, and it was like a dessert kind of thing and it was like, I don't know exactly what it was, but the way they described it was, “This is the Good Luck Chuck of ice cream pizzas.” I literally remember exactly where I was when I read it and it was literally like, it was like a cruise missile out of nowhere. So anyway, I just love telling the story because it just cracks me up. Whoever wrote that was genius. What a brilliant review. Jeff: You had a job. Brian: But with that being said, back to your question, I've never seen anything like this. I mean, I absolutely never ... Everyone loves it. Yeah. Jeff: I think we're all collectors at heart. I think that's the … Even if you don't have an entire room devoted to your favorite fandom, which I do, but, I mean, if you don't have that … You want it, like you envy those that do. I think that this show is not only a celebration of the collector ideal, but I'll tell you, I love the show because of what, it's a wealth of knowledge, you learn so much. I was talking with Dustin on the way up here actually about the Transformers episode from Season 2. Jeff: Yeah. Like how everything like changed hands and came back and Transformers was really this transformative toy, and never in a million years did I ever know any of that, and I'm learning that from this show. I think that's makes it not only fun to watch but important to watch, I think that's really cool. Brian: Well, I have always been a huge Transformers fan, I was not a He-Man fan. So, He-Man was all very interesting to me. Like my little pony we're doing now, like it's so interesting, but Transformers, a huge part of my childhood other than maybe Star Wars and maybe GI Joe, I don't know any of that, like we were there in Japan filming being like, “Wow,” like the guy that you see in the episode, maybe I talked about this last time or not, I don't know. Jeff: No. We didn't talk about Season 2. So, yeah. Brian: Okay. The guy in the episode who's got the ... And I feel horrible I don't remember his name, but he's got the photo album will the Polaroids. So, the guy with the Polaroids had come the day before, not because he was worried about getting scammed, he saw how real it was, and everything was serious and it really was Netflix and everything. So, he went home, and I don't know if it was an attic or a basement. He literally spent almost the entire night looking for that photo album, shows up the next day with it. He literally was holding it, we were doing the interview for hours and then finally it was like, “You know what? I brought some pictures,” and we were like, “Oh, really? We'd love to see them.” I mean, I literally like had chill, I mean, I like teared up, like it was crazy. Brian: So much stuff we saw everywhere should be in a museum. Brian: Yeah. It's crazy. It's not in a museum. Jeff: Now, are you on these trips as they're filming all this show and being able to see all this? Jeff: So as a fan, you're geeking out as well. Brian: I mean, geeking out doesn't even do justice, like that's not even like an accurate or strong enough expression. It's like you're there with the Indiana Jones with the staff with the light going through the thing. When we went to Takara, similar thing where Takara was very generous and let us, they have a little mini studio. We were doing interviews there, and then we weren't even doing the Takara stuff for like two days. So, they again, they saw what we were doing. They saw what we cared about. Hasbro had been like, work with them. So, one day, our day of shooting, we'd already been there two days. So we were very, very, very familiar with the office. We come in the third day, which is the day where shooting their stuff and interviewing their staff. These very Japanese offices are really interesting. They're no support pillars in the ... Like all this load lifting, bearing lifting things, whatever they call it, I guess we're in the corners of the building. So, you just see these endless … It's like you could stand on one side of the building and see the other wall and then they'll be dozens and dozens and dozens of people all at a giant room the size of the floor. So, we're walking through that for two days. So, next day we come in, I mean, this is not probably the right term to use, but like when you go to Home Depot and they have those giant plastic boxes for you to put like firewood in or something, leaves, I don't know, the whole floor was covered with them, stacked up, and we're like, “What's going on?” And they're like, “We went in archives and brought up some of our stuff. We don't even know what's in there.” And the wooden heads that we showed, that transforming VHS tape and everything, that's what was in there. Brian: Well, it was like, to your point, it's like this stuff like, this stuff should have been in a museum, this stuff at auction would have gone for 50 to a quarter million dollars and it's acting like in like a greasy kind of like paper towel, I told the story a few times, all the handwritten character sheets we have for the Transformers bios. Brian: He didn't even have them in a bag. He literally took a three-hour train just holding them, like no folder, no nothing. I guarantee you that would have gone for half a million to a million, all of them. Brian: Optimus Prime’s bio, Megatron’s bio, Star Scream’s bio. Yeah. We literally found like a folder and a bag to take it back. It also says a lot about these guys too, like they're so humble. Yeah. Like Larry Hama was like he doesn't even completely understand what he did. Jeff: I think again, back to my point of this show's important because as a child of the '80s, I grew up with this inherent need for action figures and toys of the things I loved and was ridiculed for a lot of that stuff, because, I mean, some of it wasn't cool to collect or whatever. Now with this this geek resurgence that we live in and everything from our childhoods is cool. The story, the origin, the history of that is like nobody knows it, like you said, even the people in it have boxes of stuff, they don't even know what it is and you are uncovering that, you are Indiana Jones. Dustin: Yeah. Have you gotten more skilled at digging up the weird nuggets of knowledge now that you've done it a couple times? Brian: Really. Then watch He-Man. Jeff: I've watched them all. Honest to God, I've watched the both seasons a couple times each. But Hello Kitty, I've shown people because a bunch of my guy friends that we do nothing about you know, Hello Kitty. That episode is so exciting and interesting because I had like basic thing, I had no idea that there were 400 characters created by this company. I thought Hello Kitty was its own thing and it was like, “We're marketing this,” you know? I had no idea about that. Jeff: Done. Done. I will, I will. Brian: Funny thing to show you. Brian: We're doing a show with them now. Brian: Because of that. Yeah. Jeff: Is it something you can talk about? Brian: Well, [inaudible]. Yeah. It all started with him loving the show. Jeff: Wow. Wow, that's so cool. Well, I can say that Dustin have myself or both fighting over our new favorite episodes for Season 3. I know mine is most likely going to be Teenage Mutant Ninja Turtles, because when we had you on first, you were talking about how you really wanted to be able to do one of those, but I know you are very excited about the Power Rangers. Dustin: I mean, I did collect Teenage Mutant Ninja Turtle, I remember that Donald Turtle that you had to wind up and it's swam. [crosstalk] That was really sad when that broke, when I was a kid, the wind up thing? But Power Rangers, man, I remember saving up lawn mowing money to get the big Power Ranger line. Dustin: The first big one. It was $45, I remember the Toys R Us. Yeah. No doubt, that will be my favorite episode. Brian: It is similar to He-Man. I don't know anything about Power Rangers. It is crazy. I mean, because Transformers, as wacky is it started off, Hasbro knew what they were doing, and Hasbro took it and put it on trench. There was no Hasbro for Power Rangers. So, Power Rangers was just this crazy thing in Japan to my American eyes and then some guy did a deal, Sorbonne. Like the whole thing is … One of the people I've met who I'm like obsessed with is this the executive, I'd never heard of her, I've never met anyone who's heard of her name is Margaret LaRoche, and she was the executive Fox, that green lit Power Rangers, Batman, The Animated Series, X-Men. Have you ever heard of her? Jeff: But thank you. Thank you for doing that. Brian: Yeah. I'm trying to do something with her that to blow … She should be doing conventions, I mean, it's crazy no one knows who she is. But she told the story, her boss, and does this cliched story exists fairly often in our business where her boss was like, “I'm going to let you do this, but if it bombs, you're fired.” That story, we've all heard. The story she told, that I love that I never heard before, are you familiar with this thing called upfronts, do you know what that is? So, in the TV business, this has been going on 30, 40 years maybe more, there's things called upfronts and that's where network brings their new shows to the advertisers and they make little trailers or they have a whole episode, they're like, “Here's what we're doing.” Like, you can read about like, “CBS at this year's upfronts raise $7.9 billion dollars.” That's how the whole business works. Jeff: Got you. I got you. Brian: Yeah. Margaret told the story where she was like … Literally the morning of the up fronts, the head of ad sales whose entire job is to make money literally came in and was like, “Please take that robot thing out of our real. We cannot show ... I know these people. I have to travel the whole year and get money out of all these people.” By the end of it, was literally in tears, like crying, like, "You're going to ruin the entire upfront for Fox if you have that stupid robot thing in there." And it became what it became. Dustin: But she kept it in there. Brian: She kept it in. Yeah. Dustin: Yeah. That's credible. Yeah. I watched that show incessantly as a kid. Brian: Yeah. I mean, I'm 42, so maybe I just aged out. Dustin: … there's nothing like it on TV at the time. Brian: You're definitely in the majority. Yeah. Believe me. Dustin: I'm only slightly ashamed. Jeff: My Little Pony, that's right. Brian: Which is a great story. Jeff: That, and again, I'm very excited about that because I know nothing about My Little Pony, [inaudible] talk and do things that I'll do. Yeah. Jeff: Now, how many do you have? Brian: I think I have three, and, of course, just on general principle, I had to get Battle Cat. Brian: Because that was one of the funniest moment of the two seasons. But I haven't gone crazy with He-Man, I have gone crazy. We're Good at Tama, that's Hello Kitty Cat there. I have become literally obsessed with it, the lazy A-guy. I have a whole shelf of my collection [crosstalk]. Brian: Like trying to do your own makeup, but they were like chemistry kits and people were getting horrible. Dustin: That sounds like an eyesore, literally. Brian: “… they like hair, they like horses. Why don't we just glue them together.” day. That's basically how it happened. It's more complicated than the new ones, but it's a really great story. Brian: Yeah. Like I said I can already feel … I'm telling you, no offense, man, I've still not bought a Power Ranger. Dustin: You're going to make me dig mine up there [inaudible]. Dustin: It starts with a G. I can't remember. Brian: I couldn't even tell you, but it's a great story. The story is, I mean, wonderful. Like I said, it's like a whole giant, like train tracks system without tracks, that's what the story is like. Dustin: Do you feel some sort of responsibility at this point to bring all this information to light of Toys possible, or? Brian: I mean, I feel there are 20 great stories including the eight that have aired and the four we're making. So, there's eight more great stories. Dustin: You already know what they are? Brian: Sure. Yeah. It's my opinion, I could be wrong. Everybody might have their own 20 best. I can make a bullet proof argument and say, “These needs to be told for blah, blah, blah, blah. There's no denying it, they're popular, they're … Yeah.” But then there's about another four to eight that are I think would work. We probably talked about this, like I really want to do the Toys That Should Have Not Been Made episode. Jeff: I love that idea. Brian: That is the poster child for that episode, my inspiration for that episode is the dune toys that are JL made. I mean, just spectacular bet the farm, lose the farm, by the way. Brian: But they made like, I think, six vehicles, like 12 figures. One of the things the show has done for me … Well, we'll see how the value goes up or down. But if it goes up, this is great. If it goes down, not great, but I've gotten a lot more in the prototyping. Not a lot more. That's not true. I was never into it now a minute, and now I'm in it. Jeff: So, zero to a lot more? Brian: Yes, yes, yes. I got a prototype of a dune, RJL dune that never went into production. So, that's the dangerous part about making a show like this. Jeff: Wow. That's cool. Well, we are so excited for more seasons, more episodes of this. Yeah. It's just it's just awesome. Like I said, that when we had you on in the first season, we talked a lot about the inception of this show, we talked about that the one thing we didn't get to talk to you about is the other side of what you do which I think is so interesting of what everything you get to do with comedy dynamics. I really want to know like, do you think …? I want to start it like this. Do you think that with streaming service and the myriad of ways we can consume entertainment now, do you think we're coming back to a comedy boom like we used to have in the '80s and '90s? Brian: Can I tell you a transitionary story from toys to comedy. Brian: This is two weeks, in this room, Marty Abrams is here. Marty and I, we're talking for about an hour, hour 15, and he's doing this whole new thing would target trying to, it's working, from what I can tell, it's a big success. So, we're talking and he's like he saw Sam Kinison over there and he's like, “We really want to do a new media figure of Sam Kinison.” And I'm like, “I know the guy who runs a company.” Peep, peep, peep, I introduced him on my phone, he's like, “Well, anyway …” I'm like, “Well, who?” He's like, “Johnny Carson.” I go, “I know the guy. The name's Johnny's state, I know Johnny's nephew.” And then he goes, oh, God, this made me laugh, he goes, “So, you used to be in comedy?” I'm like, “I used to.” That's one way of looking at it, some people say I'm still in it. Dustin: It's a weird relation. Brian: It's completely weird, but a lot of people especially when the show first came out were so shocked at how much humor and comedy there was in Toys That Made Us, that's why the people are hired, or were all comedy people. But to answer your question directly, I just want to tell you Marty's story. Jeff: Do you think we're coming back to a comedy boom? Brian: No. I don't think we're coming back to a comedy boom. I think that the whole situation has changed, and I'll give you a great example of this. This also, swear to God, just happened two weeks ago, not in this room, this happened two weeks ago. I was at a party with the friends of the kids, so my kids are in school. I don't go to these very often, so it's kind of hard for me to describe. Rent a house, and it's all parents of the children. There's no children, all the children are in bed. And that's why this is not like another boom or interest. Everything is changed. It's like … The way I look at it is like 50 years ago or so, like horror movies were a part of drama, and then one day there was like enough horror movies. Maybe it was the shiny, I don't know what it was. But some horror movie finally had the newspapers and everybody and the public being like, “No. horror films are their own their own thing.” That is what's happened with standup. So, for 50 years or so, going back to Carlin and Lenny Bruce and everybody, standup was this kind of it was kind of like the farm team fringe of comedy in that like when I was growing up, I kind of understood that Roseanne did the speaking thing. Like when she wasn't doing Roseanne or Bill Cosby had like, done album. Like, but it didn't mean anything to me. Like I never went to stand up as a kid. I never watched stand up as a kid. Like we only had one album, which was Cosby. So now, and the example I always give, and I mean, I don't have this as like a fact, but I guarantee you this is an accurate example of what's happened, my high school, when I was little, let's say it held 1000 kids. So, I'm sitting there in like 1992, 1993 and of the 1000 kids in there, maybe one or two were talking about standup comedy. My high school is still around, I have to assume still holds about 1000 people. So, it's a good control apples-to-apples. I guarantee you every day, on a regular day, 10 to 20 people of the thousand are talking about standup comedy. But on the day or the Monday after, a Chris Rock special comes out or a Tom Segura special or the new Chappelle, guarantee you 50 to 150, maybe 200 of those thousand people at some point are talking about standup comedy, and that's never happened before, it's not a boom. What's led to it is, it's a whole bunch of stuff all coming together at the same time. It's social media, it's YouTube. And then, as all that was starting to work, Netflix is like, “You know how some companies used to make like three to five of these year, we're going to make 52 a year,” and they're all great. There's no degradation in quality. They're all great artists, people you haven't heard of, and then the huge people the Seinfeld's and whatnot. So, what I think happened and I always say this, but just to be clear, this is my opinion, I can be wrong with everything I'm saying. But what essentially happened was when I was in high school or college even, the barrier to entry for standup comedy on Comedy Central, or HBO, or Showtime, or whatever was an hour of your time. So, are you going to watch friends? You can go out and play football. Are you going to go to the bars? Are you going to see someone you've never heard of in your life and give them an hour? Now, basically, what happened is because of YouTube, and because of Facebook, sorry, because of YouTube, and because the Facebook, yeah, those are the two. Now, and this is how it's really happening. Your best friend who you've known for 30 years is like, dude, check this out. All my friends on Facebook, Tom Segura, four-and-a-half minutes. I don't know who this guy is, but I know you and I like you and I trust you. So, I'm going to give him four-and-a-half minutes. Now, I like it. Now, I go to YouTube, I watch seven or eight more clips, “Oh, my god. I love Tom Segura.” Then Netflix puts out another Tom Segura special. Then you see somewhere Tom Segura's coming to your north of Albany, where do you live again? Dustin: Yeah. You're got it. You nailed it. Jeff: I know where I am. Dustin: ... three or four times on this [inaudible] so far. Brian: I'm terrible with that too. But that's how it's happened where it just all feeds on itself. So, that's why when people are like, “Oh, it's like the '80s, there's going to be another boom and bust.” No. '80s was artificially inflated for a bunch of reasons, but it was one show, and that show was canceled, and then the bust happened. Now, it's its own standalone genre. Now you have people who are like, “You know what? I don't even want a sitcom.” Like Gary Coleman. Do you guys know Gary Coleman. Jeff: I know him, yep. Brian: Again, now he's going to seize me like, “Dude, of course, I want a sitcom.” My point is like there's a lot of stunt Louis CK, and I know not the greatest ending, but he literally for was like, “You know what? I'm just going to do standup.” Then that eventually translated into the shows. But that wasn't like that, like Tim Allen, no one would know who he was without [inaudible]. Jeff: Right. Of course. It's funny that you brought up Tom Segura like that because you literally explained how I became a fan of Tom Segura, my friend posted a clip on Facebook and I was like, “Who is this person?” And started watching it, and now I've seen all of this specials, that's what's really neat about that. I think what's cool about like this whole Netflix ideal of being like we're going to push out 52 a year or whatever, I as a lover of standup comedy, I've loved standup comedy since I was a kid, I loved being able to see new people I've never heard about, because I'll click on ... I don't care what it is, my wife and I will be like, a new one will pop up and Netflix, watching that and giving it a shot because it's like, for so long, it was like, okay, I can see a new Patton Oswald, or a new Dave Chappelle or whatever, and I know they're going to be great because I'm already a fan of them. But these people that I'm discovering is so cool. Brian: I think other than you, I think for most people, that is a reasonably new phenomenon. That's only been about 12 to 18 months. There are towns that for 50 years have had one or two standup, a place like Phoenix or something like that, San Antonio that could support two clubs and one of them was always on the verge of going out of business. A lot of these towns now have four clubs, all raging and buying bigger rooms and improvs now. They used to like get some crappy corner in the mall 10, 15 years ago. Sorry, Judy. Now they're spending like $3 to $6 million building a new improv, and they're doing great. So, yeah, I don't think it's a boom, I think … Listen, there are years where horror films are more popular than others. Jeff: That's true. That's true. Brian: It'll be like that. It'll be up and down, depending on who's doing what. Dustin: Do you think there's a concern of the comedy special getting watered down just because there's so many comedy specials out there? There's so many streaming services hopping on the comedy bandwagon that people, I mean, it's almost like the Netflix hole, you go you go on Netflix, you don't know what to watch because there's everything available. Brian: I don't think so because, again, it's just like horror films. Like, I don't know if you've seen the trailer for this movie called the Nun. Brian: You've probably heard that YouTube took it down because people were getting too scared. Jeff: Too scared. Yeah. I heard that. Yeah. Brian: I heard that. Dude, I heard it before I saw it. It's scary. Brian: It's scary. Like I saw it before Crazy Rich Asians, and I mean, the whole audience jumped at the end. Brian: The Purge. It doesn't hurt The Purge. Brian: Yeah. It'll be the same thing with standup, that for whatever reason the stuff that's cool and people like, floats up. And the stuff that doesn't, doesn't. It's a genre now. Dustin: Do you think there's a creative take on the comedy special that hasn't been done yet? Brian: I'm going to get in trouble with this. Dustin: I ask all the good questions. Brian: For you maybe, not for me. Here's my take. I've really thought about this a lot. I've been doing this for 20 years, I've seen a lot. So, this could come off as me being lazy. But this is a thorough analysis of what I've done, but also what I've seen other people do and it not work. You don't want to see gimmicks, you're standup fan, I don't want to see Tom Segura come out on a tricycle with robots telling jokes. Jeff: Though Tom Segura on a tricycle ... But no, but I get what you're getting at, yeah. Brian: You know what I'm saying, it's like what's true is what's true is joke, is big bikes joke. Bad example. Bad example. Jeff: It might be good. It might be good. Brian: But it's like you don't, you just tell the jokes, you just tell the jokes. It's like if you ever driven like one of those, have you seen one of those Indy 500 cars up close? Dustin: Yeah, and it's a shell. Brian: With some aluminum rods and a plastic thing. Dustin: Plastic shell with stickers only, yeah. Jeff: Yeah. That's it. A seat. That's it. Brian: All it does is take away from the jokes. That is my opinion. I could definitely be wrong. But I've seen lots of people try, I've never ever see it catch on. Not once. I've never seen anything like that get a second season. Yeah. I could be wrong. Brian: And that's now luckily really becoming the norm, those big ... By the way, there's one big exception of this was Tracy Morgan special. Jeff: Oh, my God. Yes. Brian: I've sometimes watched that opening without watching the standup. That makes me laugh so hard. Jeff: I mean, there are some that really works well. Brian: Is he handing out the money from the Walmart Bank? Dustin: You're not patting yourself in the back? Brian: No, no. That just made me laugh every time I see it. Jeff: That's so good. That's so good. I mean, I know you probably have a ton in the works, can we talk about any upcoming comedy specials that have been announced at least? Brian: Well, I mean, I can pretty much talk about anything we shot. It is a public medium. Jeff: It's true. It's true. Brian: A lot of people are witnessing what we're doing. We just shot Chris Porter's new special, do you know Chris Porter? Brian: Why isn't this guy bigger. Jeff: I know, he's very funny. Brian: I don't understand it. Jeff: I've seen him on YouTube ads. Really fun. Brian: It's brilliant. We shot Alice Wonderland, do you know her? Jeff: No. I don't think so. Brian: She was on Silicon Valley, she's great, absolutely brilliant special. We just did finesse Mitchell, which is going … can't say with that, that I can't say, can't say what else is gone. Our model is a little unusual in that we shoot it ourselves and then we sell it later. Most companies get hired to go make something for Netflix or make it [inaudible]. We do what we want and hope other people like it. They usually do, but not always. Dustin: Is there a reason for that? Brian: That's a great question. It's funny, man, no one asks that, no one asks that question. The reason is, there's many reasons, or not many but there's several reasons. One of the reasons is when we first started doing this almost 10 years ago, we had no choice, nobody would hire us. So, we just had to do what we were doing, pray to God it works. If you're hired to do something, you make profit on that job, but then you're out. This way, we make it, we'll license it to another one of those companies for two to five years or something. But then it comes back to us and then we keep making money on it, they don't. And the artist too, by the way. So, that's probably big part of it too. But it started out of just we had no choice. It was just sheer desperation. Nick De Pollo, that was the first one. Those cameras were bought to do Nick’s special. Jeff: That's incredible. A question I've always had actually about comedy specials, and from the producer's side of it, and you guys are saying that you are shooting it yourselves. And then shopping it, does location come into play? Is that from the comedian being like, “I want to have my special here”? Or is that kind of your … Like, do you kind of help them along with that idea? Brian: So, there's a … We could break it down by risk. So, if there's an artist who's selling 8000 to 20,000 tickets a night, they tell me where we're shooting. If they're someone selling 1000 to 3000 tickets a tonight, we have a discussion. But at the end of the day, we're going to do what they want. If there's an artist like Tom Segura or Alley Wang that when we do their first special, they can sell a lot of tickets, but nicely. They'll be the first to tell you by the way. Jeff: Yeah. There are up and coming. Yeah, yeah. Brian: Then we have a much bigger say in where we shoot. There's a bunch of cities, Denver, Minneapolis, Chicago and Seattle in particular that we love shooting in, because we love the cities in terms of the audience's that those cities have. But also we know certain venues that they're gorgeous, but they don't have crazy fees. Like there's certain venues that are gorgeous, and you got to pay 10 grand or more just to be in there. That doesn't help the audience, it delays profitability, and then you'll have literally six blocks away something equally beautiful, if not more beautiful, and just for a variety of reasons, they don't charge that. So, we have a bunch of venues we shoot in frequently. Jeff: Yeah. That makes sense. Brian: If we're doing our job correctly, you'll never be able to tell. Not never. That's not true. If you watch these things over and over again, of course, you can tell. Jeff: Right. Now, I've always wondered that because like, sometimes you see comedians show up in their hometown, or their favorite club or something like that. But then a lot of times, it's comedians in a random place. I always wonder if that was their decision or not. Brian: Many times it is. But one of the things you say to the artist is, “I was a manager, I was a manager for like 10 years of only comedians.” One of the things is, you have to make comedians feel safe, so that they can get up on stage and do it and be confident and do their thing. So, the key is when you have the conversations in this room or during pre-production on a special where you need to talk to them in a certain way where they feel like they're in charge because they need to feel like they're in charge, they need to be in charge, they should be in charge. But you also guide them to not go to a venue that is 50 grand more that night than literally the place across the street. Cleveland's a great example of this, by the way. Cleveland has the street of theater's. It's awesome. I mean, literally, this one's 80 grand just to turn the lights on, this is 500 bucks just to turn the lights on. Both of them 20-year-old venues, we've the gorgeous, whatever, architecture, but just different politics, different rules. So, you try to guide and you're really partners with the artists, so you talk to them as a partner, and 99.9% of comedians are some degree of, maybe not point 0.9, 99, yeah, so every 100 comedians 99 are cool, one's not. So, they know you're a partner. So, you act as partners and you make the decision together, yeah. Jeff: At this point with comedy dynamics after it's been churning out this incredible stuff for over a decade now to 20 years, 10 years. Dustin: It'll be 10 years in November. Jeff: So, at this point in the game, are you contacted by comedians to make their specials? Are you still actively being like, “Hey, we want to make a special for you”? Brian: It's both. Like I said, last weekend we shot Chris Porter and we shot Alice. Alice, everything she's ever done, that I've seen her in, she always pops, that's a big thing for me. Every scene of hers in Silicon Valley, you forget everyone else is in the room, there's a movie, I always screw up the title, it's like Dave and Matt Need Wedding Dates. Jeff: Yeah. I can't think of the title either. Brian: Is that [inaudible] on film? Jeff: Yeah. What's funny is, is that true story happened in Troy, it's two guys from Troy in New York. Brian: Are you guys from Troy. Jeff: Well, no. But that's [crosstalk]. Yeah, yeah, yeah. Brian: I know Troy. I know Troy actually. It's funny. Jeff: So, I totally know that movie. Yes. Jeff: She should have a great special, yeah. So, that's how those come together, but then Friday when I was in Denver, I got a call from one of the biggest most respected comedians of all time, calling me, it was his agent saying, “Hey, man, if you want to make an offer, make an offer. I think the time is right for him to do one and I know he wants to do it with you guys.” Sometimes on that phone call, you work out the whole deal, sometimes you don't, you just fire away blind and you pray to God you're not too low. The worst thing you could hear was an agent response to your offer with, “All right. So, I'm not negotiating the price.” Because that means we came into high. That's the worst thing we hear. It's also bad to hear, “Get out of here. This is offensive.” That doesn't happen. I usually overshoot, rather than undershoot. Don't tell the CFO, but it all works out, it all works out. Brian: Oh, my God. Do you still actively go and tell live comedy to look for people? Brian: When I was in Denver … No, No. Absolutely not. Jeff: No. You're not scouting. Brian: Remove the word still. I never did that, never, ever, ever, ever did that. Dustin: You seem to have big box for that, is there a reason, or you just-? Brian: The reason is this, like I told you, I used to be a manager, and when I was a manager, I would have clients that one year, let's say, 2004. I'd have a client in 2004, he would go to Austin, Texas. He would sell 200 tickets, then 2005, he would go to Austin, Texas, he would sell 3000 tickets. Then you go back 2006, he'd sell 9000 tickets, then I call people at the networks and be like, “You guys, you've got to give them a half hour special. You got to give them an hour special.” They would say no. It always was crazy to me, that the amount, I'd be like, “Look at this data. I'm not lying. Yeah, he sold 200 tickets three years ago and now, he's selling 9000. Who cares what you think? Dude, look at these numbers.” It never mattered. So, I resolved that if I was ever in a position where I was making the choices, I would respect my gut, like I told you the story about Alice, and I told a story about Chris Porter, but I wouldn't be dominated. I am proud to tell you, I have made specials, I didn't find the people funny. Like that's not my job. I'm not a gatekeeper to America. If there's a comedian that's doing great, and obviously people in our country like this comedian, who am I to say he or she doesn't make me laugh? That's not my job. By the way, it's also a great way to lose money, and to lose a lot of options. There are networks focus on comedy that missed everybody. They missed Kevin Hart. They missed Milburn. Make fun of them all you want, but the still they missed [inaudible]. Jeff: Is usually the thing you’re looking for. Brian: Well, it's usually … Like if you google Tom Cruise. Weird example, but that's what I came up with. The first thing about Tom Cruise will be the article that has the most things connected to. That's how the Google algorithm works. So, that's sort of how we do it, but we do it with agents and managers who we trust where if this, especially by the way, if an agent who I trust and a manager who I trust are both together working on the same artist, we've never failed, we've never backed anyone like that who didn't blow up and become very successful or the very least extremely respected. Jeff: So, you keep your bias and opinions separated from your business? Brian: Like I said, no one called me about Alice, that all me right watching the pattern of someone dominating no matter what she did yeah and going with my gut. But like I said, weekly, we received phone calls of people literally we might not laugh once in 10 specials they do, but America loves them, they're an artist, they have their own thing. Just because it's not for me, doesn't mean it's not for everybody else. So yeah, we do both. Jeff: Yeah. Well, I mean, go with your gut, especially when you're going and watching comedy specials that are produced by comedy dynamics. Jeff: Well, I mean, I devour all of them. Finally, I have to ask because it's been the elephant in the room the entire time. What's the story behind the sigh? Where did you get it? Brian: Yeah, man. It's sad, man. Jeff: It's super sad, but it's great that you have such a piece of history. Brian: It's so funny, is someone with three children and an amazing wife, I always feel so stupid saying this because obviously anything not connected to your family and health, who cares? I mean, I can't tell you how depressing it is to me that Toys R Us went out of business. It is one of those depressing things that's happened in my lifetime. So, the Toys R Us here in Burbank that I've been going to for 16 years in October, like everybody else was going out of business. So, I went to the liquidator and I was like, “Hey, I'd like to buy that sign.” I actually went to every Toys R Us that I go to and filled out the paperwork to get this sign. Nobody called, nobody nothing, no emails or anything, and I just finally found the name of his woman who was the liquidator for the Burbank one, got her name, found out when she would be there, and yeah, I was there, I was like, “I want it,” and not only did I get this in my home office … I can't even believe I got this. I went to pick this up and then sitting on a table of stuff they were selling which was like staplers and tape dispenser just [inaudible] from the back office was two of those old school credit card machines. Dustin: Yeah, I was just thinking about those over there. Brian: Yeah. Come for five bucks each. By the way, I would have paid 10 times with this cost. I was ... What do you think does costs? Well, no. I said, I screwed it up. Dustin: A few hundred bucks. Brian: Few hundred. I was psychologically prepared to go to 1000. Jeff: I would have. Yeah. Brian: So, I was very lucky a friend of mine had a truck and tools, I'm not the most handy. I used to be very handy. I'm not too handy anymore. Brian: Just so you know it's not sitting here like this, because this is where it's going to be, where we're getting it nicely framed and then it's going to be put up. Brian: Yeah. This is just temporary. Jeff: That's so great, and from the collector side of it too, like I said at the beginning of the show we're so excited for the new season and hopefully subsequent seasons of the Toys That Made Us. At this moment is there a release date for Season 3 yet? Jeff: We have not announced that right now. Brian: It could be Q4 or Q1. It should be before April, but there's a chance it could be December, there's a chance it could be February. Netflix is just wonderful on so many levels, but one of the things which is great about them is as long as you don't go over budget, they just kind of cool to get it right. They just leave you to do your thing. Brian: Yeah. So, I want it to be right. Brian: I'd love to not up our bad reviews. Even if we got a second bad review that's doubling our bad reviews. So, yeah. So, we're going to put the time and love into it. Jeff: Excellent. Well, I can't wait, and when it does, when it is announced for that release date, we'll obviously be talking about it at definitely Death Wish as well. Brian: Thank you. On behalf of the whole crew, and a whole show and whole company and your support, thank you so much for, we appreciate it very much. Dustin: Well, Brian, thank you for having us here. It was very generous of you to invite you invite us into your space, to invite you into our podcast. Brian: Yeah. Thrilled that you came and you wanted to. Dustin: Yeah, man, This was great and we really appreciate it. Speaker 4: Welcome back to the show. Jeff: When we came out and talked with you at your studio, you did allude to a really cool project that you couldn't talk about at that exact moment. Dustin: I also remember things being covered up on the wall with posted notes. Jeff: It's finally been announced, Discontinued actually as this episode is airing, filmed by Deathcast, this your Discontinued is out on CW and that's so cool. I am so excited about this show, like, I mean, from obviously we love everything that you've done with the Toys That Made Us, what incredible idea that is. This just kind of is piggybacking on that nostalgia bomb, did you have this idea going when you were doing Toys or with a two separate kind of ideas or how did that come be? Brian: I actually had this idea long before Toys, and if I hopefully remember correctly what I told you, whatever I develop a show and I can't sell it, I call it a Broken Arrow and Toys was one of two, actually I had three Broken Arrows. One was Toys, one was the show we're doing with History Channel, all about President Grant, and this was the third one. So, yeah. So this predates Toys by years, like three or years. But, you know, one of the things about selling a TV show is, I always say it's like the odds of selling a show in the two to five weeks of trying to sell a specific show is very low. So, you just got to keep pitching over and over and over again till the timing works out. But I think part of the reason timing worked out in 2018 and not in 2014 or 2015 or whatever is partially because as you know, nostalgia is a big deal now, it wasn't that big a deal five years ago, but also the success of Toys That Made Us. I was having lunch with an executive from the CW who I have lunch with for years two or three times a year and he was going on and on and on about Toys That Made Us and was like, “Do you have anything else like that we could do?” That's what led to the show getting green lit at the CW. Even though this came first, I think it was helped along by its ancestor, The Toys That Made Us. Jeff: That's awesome. Now, I mean, going down Discontinued food, toys, businesses that kind of stuff, obviously, there's ones that jumped to my mind immediately like Blockbuster Video or Crystal Pepsi or something like that, but could you talk about any of the ones that maybe were surprising to you, anything that were that is in store for us without giving too much away, anything that's in store for us on the show? Brian: Well, I mean, to a certain extent, and it's funny one of the one of the pods we're doing is a Blockbuster. One of the things similar to Toys is it's all of these things that we dug into, it's never you know just using Blockbuster as the example. If you ask 100 people on the street, “Hey, why did Blockbuster go bankrupt?” I bet you 95 say, “Oh, because of Netflix.” Netflix definitely played a part in it, but it wasn't just Netflix. Like, there was a lot of things that Blockbuster had done and mistakes they had made in addition to Netflix. So, what I learned from making this show was very often the thing that we think is the thing that chops the head off of a company is usually the straw that breaks the camel's back. It's rarely the thing that actually killed them. So, that is probably the main lesson that I learned with this show versus some of the other things we've done. But yeah, it's always … people are always fascinated by origin stories and I am too, but I have also always been fascinated by early demise stories or demise stories like I've always been interested in, okay, I understand why it happened, but yeah, what led to it not existing anymore and that's really what the show is about, But also similar to Toys That Made Us, we tried to do it in a way with humor and comedy so it doesn't feel like you're going to business school, you're actually enjoying yourself. Jeff: So, everybody talks about the secrets to success, do you think that you may have discovered the secrets to failure? Brian: I mean, I know the secrets of failure and, I mean, I'm not even trying to be funny. I know the secret to failure because I've been reading about businesses and people. All I read is nonfiction probably since the sixth grade. Not all, but 99% of what I read is about people and companies. The true unifying factor of failure, I mean, there's little things here and there to that add up. But the number one thing that leads to a company failing or even to a certain extent, human beings career failing or whatever is becoming complacent. The minute a company stops worrying about going out of business, I would argue, is the first step towards going out of business. So, that is the unifying, like you can't get cocky. You know, part of the reason Disney is more powerful than ever, and Fox is going to be gone in a couple weeks is really because Disney is a paranoid company, that sweats nickels. They were like that 50 years ago and they're like that now. First of all, I'm a shareholder of Disney stock and I've studied that company, and I don't mean that as an insult at all. If you're to invest your hard-earned money in buying into a company, you want them to be paranoid about their survival, you want them to sweat nickels. All the things we follow to a certain extent, have that in common. Jeff: So, do you think you've been able to take what you've learned from making the show and applied that to your own business to try to avoid these pitfalls that you regularly sign throughout all these companies? Brian: I think the opposite is the case actually were because I am so interested in failure, it's what led to my interest in doing a show like this, because this shows kind of about failure if you think about it. So again, it's always … I read this book, I don't know the name about it. But I swear to God, I read this book, every page, every word, didn't skip a chapter. In the book, I swear to God the books about 400 pages long and I think was about $80 to buy because it's one of these books that gets published for like less than 2000 people. About eight years ago, I was getting a tour from a friend of mine's husband, who's a scientist at Goddard, the NASA facility in Virginia. He told me about this book called, and I don't remember the exact name of the book, but it's something like, this book is a list and description of every rocket launch failure for the last 50 years and that's what the book is. It's literally a book that every chapter, and every chapter is like less than three pages. It's a chapter of like 1958, “Russia, blah, blah, blah. The fuel line broken and ignited the chamber.” But I read that book, every page. So, for some reason, I find the topic of failure interesting. But it's hard to sell a show about that. So, this show, Discontinued, it's a pop culture show. It's in the styles of show, but it's a deep dive into why did things that everybody knows about suddenly disappear. We did it in a fun way. One of the major inspirations is one of my favorite shows in the history of shows Mystery Science Theater 3000. Brian: So, we kind of I use that sort of as a jumping off point. I'm curious when you see the show if you could see it or not, but I was definitely inspired. I've always wanted to do something like it. So, that's what we did here. Brian: Oh, my God. If you had that thought, I bet they're getting a lot of stuff about that. That's really funny. Oh, my God. That's really funny. Jeff: But it's going to be so exciting. So, the show premieres December 16 this year. Is it going to run a full season? Is it just a pilot season? How many episodes do we have coming.? Speaker 4: This has been filmed by Deathcast, a Death Wish Coffee Company podcast production. Thanks for listening. Brian Volk-Weiss is the CEO of Comedy Dynamics and the producer of the brand new show for Netflix, The Toys That Made Us. Ming Chen is part of the elite crew of friends of Kevin Smith and talks about his time on the AMC show, Comic Book Men, and his convention experiences.